Elucidation of all of the factors governing the release of GnRH as well as a biochemical description of their actions are only now emerging. The problem has not been readily approachable through the classical biochemical techniques of fractionation, purification, and so on due to the complex, but critically important, anatomical relationships that exist between the CNS, the hypothalamus, which secretes GnRH, and the ade-nohypophysis of the pituitary, which is the site of action of GnRH. The release of GnRH from the hypothalamus is determined by an integration of visual, olfactory, pineal, and stress signals, as well as endocrine factors; thus, the hypothalamus acts as a clearinghouse to determine whether GnRH should be released (see Figure 13-6). The release of FSH and LH is a highly regulated process determined by (a) negative feedback, (b) positive feedback, and (c) neural components. The decapeptide GnRH is released from the hypothalamus in a pulsatile fashion with short latency and initiates the concomitant secretion of both LH and FSH (see Figure 13-9). The steroid hormones progesterone and estradiol can also function as both negative and positive feedback signals at both the CNS and pituitary levels to diminish GnRH and gonadotropin release. figure 13-9 Pulsatile secretion of gonadotropin-releasing hormone (GnRH) in hypothalamic-portal blood and luteinizing hormone (LH) in jugular veinous blood in ovariectomized ewes. Reproduced with permission from Clark, I. J. and Cummins, T. J. (1982). The temporal relationship between gonadotropin releasing hormone (GnRH) and luteinizing hormone (LH) section in ovariectomized ewes." Endocrinology 11, 1737-1739. To target cells figure 13-10 Schematic model of paracrine and autocrine regulation of the pituitary gonadotrope by activin, follistatin, and inhibin. The secretion of LH and FSH occurs from separate gonadotropes, either A or A', both of which are stimulated principally by GnRH. However, a fine-tuning of the secretion of LH and FSH is effected by the combined actions of inhibin, activin, and follistatin. In this model, activin, which is produced by gonadotrope A, has its actions on both gonadotropes A and B diminished by follistatin Modified from Bilezikjian, L. M., Corrigan, A. Z., and Vale, W. W. (1993). Activin-/3 and follistatin as autocrine/paracrine factors of the rat anterior pituitary. From 11th International Symposium on Inhibin and Inhibin-Related Proteins. Siena, Italy. both been shown to be capable of stimulating GnRH release. The primary action of GnRH is to stimulate both the acute release and the biosynthesis of LH and FSH. The first step is the binding of GnRH to its receptor on the plasma membrane of the gonadotroph (see Figure 13-11). This initiates a complex series of signal transduction events (involving PKC, intracellular Ca2+, IP3, and DAG), which result in a prompt (within minutes) secretory burst of LH or FSH. The mechanism(s) by which GnRH stimulates the expression of mRNA for LH and FSH is not yet known. The principal biochemical actions of FSH and LH are to induce the production of estrogen (by the ovarian thecal cell) and progesterone (by the corpus luteum), respectively. Their generally accepted mechanism of action is not dissimilar from the actions of the peptide hormone ACTH in stimulating steroidogenesis in the adrenal cortex (see Chapter 10). figure 13-11 Schematic model of GnRH-mediated secretion of the gonadotropins LH and FSH. Dashed lines indicate pathways where the mechanisms are unknown. Abbreviations: PIP2, phosphatidylinositol 4,5-phosphate; DG, diaclyglycerol; PKC, protein kinase C; IP3, inositol triphosphate; G, G protein; PDE, phosphodiesterase (phospholipase C); cal, calmodulin. Modified with permission from Marshall, J. C. (1995). Regulation of gonadotropin sectetion. In "Endocrinology" (L. J. DeGroot, H. G. Burger, J. L. Jameson, D. L. Loriaux, J. C. Marshall, W. D. Odell, J. T. Potts, Jr., and A. H. Rubenstein, eds. ), Vol. 3, pp. 1993-2007. W. B. Saunders, Philadelphia, PA.
Receptors for both FSH and LH are present in the cell surface of their respective target cells. 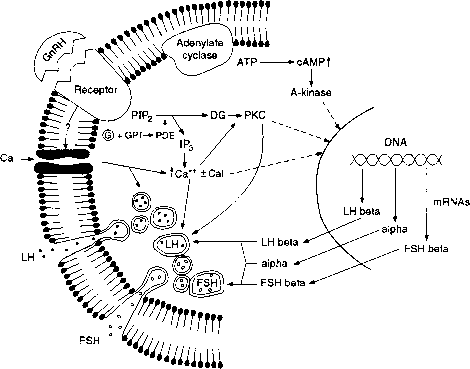 Both FSH and LH intracellularly stimulate the production of cAMP by adenyl cyclase. Ovarian cells also contain receptors for prostaglandins and catecholamines, both of which can mimic some of the actions of LH and cAMP. The cAMP then, as shown in Figure 13-12, activates a protein kinase that stimulates cholesterol side chain cleavage, eventually increasing the production of estradiol and progesterone. It has been demonstrated that there is a good correlation between receptor occupancy by LH, stimulation of cAMP, activation of protein kinase, and progesterone production. LH mediates a large increase in the activity of the cholesterol side chain cleavage enzyme, which is the rate-limiting step in the ovarian steroidogenesis pathways. LH also stimulates the gene expression of 3/3-steroid dehydrogenase, 17a-hydroxylase, and 17,20-lyase (see Table 2-6). Further work is required to describe, at the biochemical level, the complex series of steps associated with maturation of the ovarian follicle, luteinization of the granulosa cells, and formation of a functional corpus luteum. It has been proposed that the cyclical nature of the menstrual cycle is largely governed by temporal changes in the cell surface receptors of the ovarian follicles for FSH and LH. These changes in turn drive, in a cyclical fashion, the biosynthetic and mitotic activities of the follicular granulosa cells and the steroid-producing thecal cells. In the early phases of the cycle of granulosa cell development (day 26 of the cycle), the granulosa cell is quite dependent upon FSH. At this point, it has largely FSH receptors and only a limited number of LH receptors; it is rapidly dividing, growing, and acquiring the enzymatic capacity to aromatize androgens to estradiol. At this point the production of estradiol is a collaboration between the surrounding thecal cells, which convert cholesterol to androgens, and the granulosa cell, which converts the androgen to estradiol. This granulosa-produced estrogen then collaborates with FSH to speed up the replication rate of the granulosa cells. Thus, although there is now (days 8-10 of the cycle) a falling plasma concentration of FSH, there is an increased capacity to respond to FSH (due to the increased concentration of FSH receptors) and to produce estradiol. Concurrently there is an increased concentration of LH receptor on the thecal and granulosa cells in preparation for ovulation and formation of the luteal phase of the cycle. Inhibin, which is secreted by the granulosa cells, has been shown to effect the inhibition of FSH production and release by the pituitary. 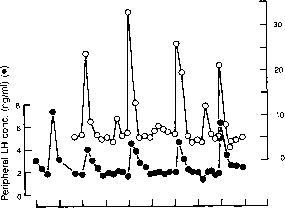 Then as the late follicular phase ensues (days 11-13), the aromatization capacity of the granulosa cells becomes maximal and the blood level of estrogen rises dramatically (see Figure 13-7), which leads to a positive feedback loop at the hypothalamus-pituitary axis and initiates the midcycle surge in LH secretion (days 13-14). Figure 13-13 summarizes the pathways of steroidogenesis that are associated with the ovarian follicle and the corpus luteum. After ovulation, the thecal and granulosa cells are transformed into the corpus luteum, which is the site of production and secretion of large quantities of progesterone and moderate quantities of estradiol. The dominant actions of estrogen occur in the female reproductive tract, although there are also significant biological actions mediated in the hypothalamus and brain as well as in a variety of other visceral organs. Table 13-4 tabulates the tissue distribution of the estrogen receptor. Summarized in Table 13-5 are the temporal events initiated in the immature or ovariectomized rat uterus as a consequence of estradiol administration. It is not clear whether all of the actions reported in Table 13-5 are mediated as a consequence of estrogen interaction with target organ-specific nuclear receptors for the steroid hormone. The presence of the estrogen receptor in a tissue, however, is presumptive of the biological actions of estrogen at that location. There is also emerging evidence that some biological responses to estrogen occur too rapidly to be mediated via the nuclear receptor. The human estrogen receptor (ER) gene and cDNA have been cloned and evaluated (see Figure 13-14). As with all classical steroid receptors, the ER gene has eight coding exons. Although the transcription of the ER gene is initiated from two promoters, which generate two mRNA species with alternate 5' ends, only one species of ER is generated after translation. The human ER is a polypeptide chain of 595 amino acids (66.2-kDa molecular mass). The ER has been shown to function as a transcriptional regulatory protein that is essential for female sexual differentiation and development. As shown in Figure 13-14, the ER has many functional domains that participate in its activation of gene transcription. The key region is the DNA-binding domain, which interacts with the hormone response elements (HRE) of the promoters of regulated genes. The consensus sequence of the HRE for the ER is shown here; it represents an inverted repeat with three spacer nucleotides (see also Table 1-10): AGGTCAnnnTGACCT.